Don’t tell my baby, but my third pregnancy was a huge surprise. My husband and I cut our wedding cake to the tune of Dean Martin’s “Memories are Made of This” – we envisioned a life with ‘three little kids for the flavor’. But just like the top to the spice jar coming loose unexpectedly and dumping a whole pile of paprika in the pot, we got all that flavor all at the same time. When Julia, our second, was born, we said, “Oh, yeah, she’ll definitely have to be older than Bella is now when we have a third.” God chuckled at that one. Just after Christmas just under two years later, we found out Number Three was on its way. Angela was born when Julia was four months younger than Bella was at her debut as a big sister. When we found out I was pregnant, my husband and I were instantly wrapped in a cocoon of haze. Everything seemed blurry and just out of reach. Lost in our own thoughts, we wandered around in shock. We didn’t tell anyone right away because we’d always waited until we knew the baby was well on its way, but also because we were waiting to wrap our heads around it. Mere days after proof positive, we attended a New Years’ Party. In attendance was a mother of three I’d come to know through the host. I knew wasn’t emotionally or mentally able to tell her I was about to join her club, but I needed some assurance that I could do this. She always seemed such a magnanimous mother, building her children up while laughing enough with them to keep them grounded. If she said it was do-able, I could do it. I asked her what it was like going from two to three children. She said, “I have never been more acutely aware of the fact that I only have two hands.” We laughed, her sense of humor seemingly able to overarch any obstacle in her way. I can still see her standing there, those two hands raised in front of her. Her words came back to me once we were all home from the hospital. When someone asked me what it was like going from two to three, I said, that yes, there is some truth to the theory that it’s easier than going from one to two because you’re used to keeping all the balls in the air – but what no one tells you is that there’s always. a. ball. in. the. air. I was a veritable ringmaster with all the balls I kept hurling into the air and trying frantically to catch and hoist again. There was no intermission. No time to catch my breath. And I felt like I’d missed a very important set of lessons at circus school. The fact that this circus took place under the big top of postpartum depression did not lend any sort of solace to the situation. There were times I felt like I was the #1 attraction for the freak show. But even though I was at the mercy of my hormones, I somehow made it through – and thankfully didn’t end up looking like the bearded lady. Life is still crazy, but I’m feeling less so lately. It’s just the usual brand of crazy, the kind that comes with three little kids and the flavor they bring (aided by the hula hoops the Easter Bunny brought each of them this year). It may have been an acquired taste, but now it’s my favorite flavor. I get you. I also have 3 girls. However, unlike you, our 3rd was the only one PLANNED. Our first was a “cart before the horse”, God bless her. Four and a half years later, our middle daughter was pretty much a miracle. Then, we decided they needed a friend 🙂 The rest, is history. 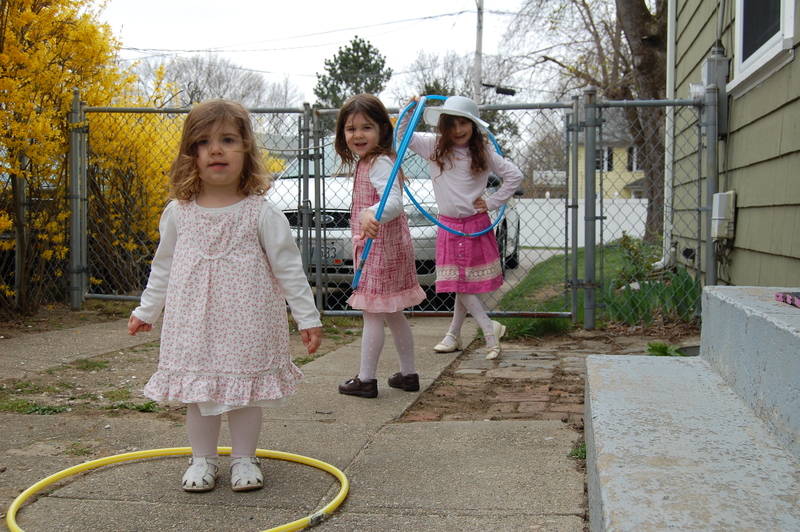 Now, at 12.5, 8 and 6 years, respectively…..my life too is a circus, and I can confidently add juggling to my bevy of skills. All 3 of mine are competitive gymnasts….so we have acrobats performing daily, and I wouldn’t trade it for anything!! You truly do get me! As my husband says, never a dull moment! Neither would I trade it for anything!